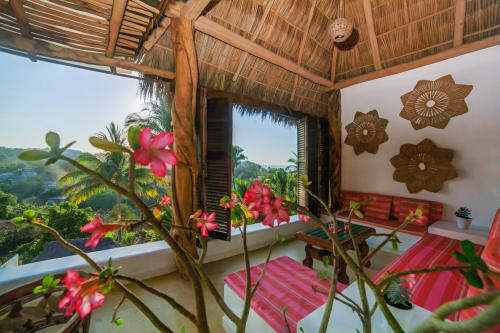 Casa Primo, nestled in the heart of Sayulita, Mexico, combines convenience, beauty and privacy for one of Sayulita's best places to enjoy your vacation adventure. 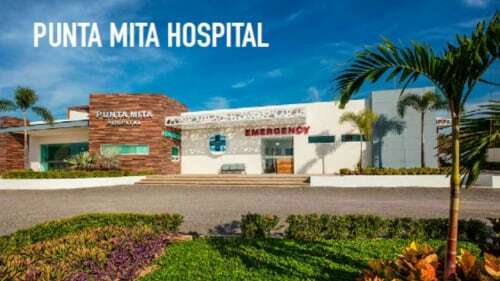 Located just two short blocks to the plaza where you can enjoy restaurants, ice cream, expresso and shops it is also located steps to the beach for swimming, boogie boarding, surfing or just strolling the sandy beach. The location is where the action is! Casa Primo has five individually distinctive bedrooms, each with a private bathroom. This air-conditioned house has a private pool which can be heated for an additonal fee. Guests can enjoy the views from our private upstairs palapa where you can watch the fisherman mending their nets or surfers gliding on waves. In the distance you may see dolphins or whales sprouting or breaching. Casa Primo's excellent staff helps ensure daily cleaning of the rooms, pool maintenance, and gardening. The house also offers a host to help navigate your stay from horseback riding or surf lessons to haircuts or beauty care or massages. The house includes an open-air kitchen with marble countertops, breakfast bar and stainless steel appliances and Gas BBQ. *Please note that due to the presence of open stairways and decks, young children will need special attention. Casa Primo was perfect for our group of 8. We needed 5 bedrooms for our group. There are 5 nice sized bedrooms, each with its own bathroom. there is also an outdoor bathroom with sink and shower near the pool. The space around our private pool was great for all of us to get together and eat, play games and hang out. The best part about staying at Casa Primo is the incredible staff. Jose was always there to take care of every question and need we had. We had Alma cook meals for us a couple nights, and the food was delicious! The cleaning staff was also respectful of our space. It was a very enjoyable and memorable vacation for our family.We will come back to Sayulita for sure, and hopefully Casa Primo will be available! We stayed for 7 days at Casa Primo in February and thoroughly enjoyed our stay at Casa Primo. We were 8 adults and 3 kids (ages 3-9). The pool and outside living area worked great for hanging out and the kids loved the pool. There were pool toys, beach toys, boogie boys, beach chairs, beach umbrellas and coolers available for our use. It was great that each bedroom had its own bathroom as it allowed for a bit of privacy amounts the family members. The house was clean and the landscaping was well kept. Also the kitchen was fairly stocked with enough apllicancra, utensils, bowls plates etc. It was missing a toaster but the house host fixed that the next day. The location is amazing!! Only 2 minutes to the beach and minutes to restaurants, plaza, pharmacies, shops...everything. There was a festival going on in the plaza the first day we got there and the noise carried to the house, so it can be noisy. The beds are not that soft but we still had good sleeps. The house host, Estella and Jose Luis were so helpful, friendly and accommodating. Jose Lui even helped us plan our mom’s bday party and helped us get a piñata!!! Bother Estella and Jose Luis speak fantastic English so it was easy to communicate. We also hired Alma to cook a Mexican supper for us. The food was delicious and plentiful. And Alma spoke great English too, which made the meal more enjoyable. I highly recommend Casa Primo if you are staying in Sayulita. The only downside to our vacation is that all 11 of us got sick with some sort of stomach bug. But if you are going to get sick, at least you can be in a fantastic house with a view of the ocean and pool to hang out by. Fantastic house and location. A stones throw to the beach and to the center of town. Jose the house manager was fantastic and very attentive to all of our needs. Teressa our house keeper was amazing and kept the house in great shape even with 9 people staying here. Couldn't of asked for more, would stay here again in a heartbeat. Amazing house in a perfect location! This house is amazing with a beautiful, serene patio. And, it is located in the middle of an iguana sanctuary! You can see the ocean, watch the iguanas sunbath high up in the surrounding trees, and get to the beach or downtown within a block. It doesn't get any better than that! Jose and Teresa are available every day to take care of all your needs. They provide incredible customer service. We had a wonderful stay and really enjoyed this house. We can't wait to return! Our family was very fortunate to spend a week in Sayulita staying at the wonderful Casa Primo. The staff, including Jose Luis, and the girls were fabulous, ensuring that all our needs were met. Julie was fantastic, promptly answering my many emails leading up to our vacation and making sure that everything was in place for us. 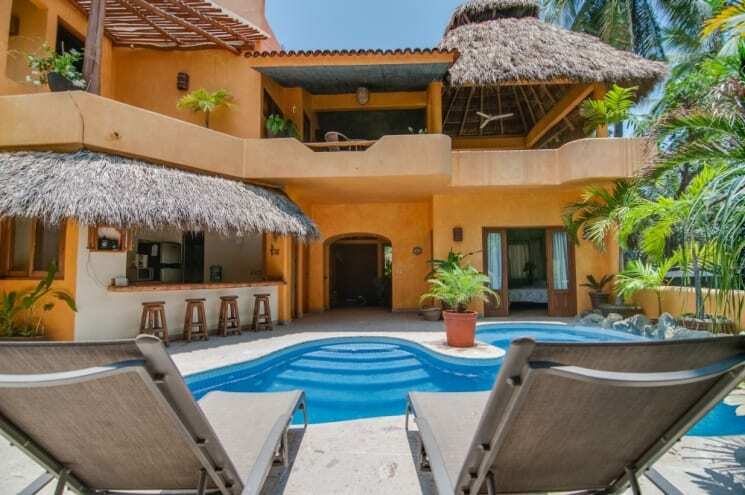 Casa Primo is well laid out, spacious and as gorgeous as all the photos indicate. It is located close to the beach and to the centre of town. We walked everywhere. 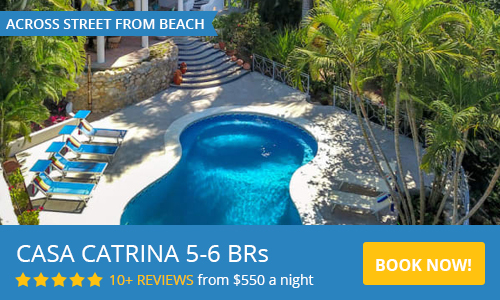 If you are looking for the perfect place to stay in Sayulita, this is it! Hi Debbie, all of us at Casa Primo were more than happy to help make your visit to Sayulita a memorable one! We enjoyed hosting your family and look forward to your return!! I stayed here with a group of 10 ladies for a bachelorette getaway weekend. The bride and I decided we had to stay here after separately falling in love with the posting online, and it did not disappoint! The 5 bedrooms and 5 adjoining bathrooms were perfect for our large party. Each bedroom had separate outside doors with locks, which meant we got a little wet during a downpour going from the rooms to the kitchen, but otherwise this gave each room some privacy and security. The house management was very helpful in securing transportation, arranging for meals to be made in house, and making recommendations about other businesses around town. No regrets picking Casa Primo for our vacation stay! Thank you Katie, we are so glad your group enjoyed your stay at Casa Primo! We will be happy to welcome you back anytime!! Fantastic rental! This house has the perfect location - everything is within walking distance (beach, town, restaurants). We especially enjoyed the patio and honestly some days didn't want to leave the house! We traveled with 2 children and they loved the pool with the waterfall. The house staff was very accommodating and any problems we had were handled immediately. Would definitely recommend and will return!